It looks as if protesters in Ukraine can topple the government, and it's not clear whether the president has the stomach or the intellect to control the situation there, Mark Almond, an Oxford University historian, told RT. 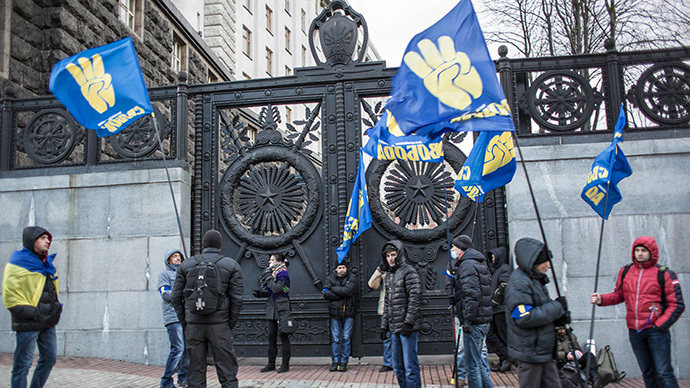 Almond believes that these protests are part of Ukraine's economic difficulties. But association with Europe "would stimulate an economic downturn and more mass migration, rather than reform process, which would improve life," he believes. RT:It does look like protesters would like to topple the government. Do you think it is likely to happen? Mark Almond: It is possible. There is a template that they are following, which happened in Belgrade in Serbia in 2000 and in Georgia in 2003: storm public buildings, hope to face a demoralized government. And it has to be said that the president of Ukraine zigzagged so much not just over Europe, but over the question of policing and it is not quite clear whether he has the stomach or the intellect to control the situation there. RT:It’s not the first time we are seeing a revolution there. What difference would a second one make? MA: This seems to be a great tragedy of Ukraine. It would seem that Ukrainians can’t learn from their own experience. After all, we had in 2004-05 the so-called Orange Revolution, and it actually gave way to in-fighting, to terrible corruption, to economic disaster – that’s what actually enabled Yanukovich to win the election and come back to power. We have to be careful with attributing what is going to the majority of people in Ukraine. I suspect the tragedy of the Ukrainians is that the great majority of people are rather passive and certainly rather disillusioned about politics on both sides of the equation. The risk now is that we have politics of two minorities. It may be that group on the streets, the group with paramilitary nationalist support from the West (including several European countries) may feel they’ve got the strength to stage a kind of coup and this could change the government, it could lead to a very violent situation and it could even question whether Ukraine is viable as a state. RT:And what about Europe’s motives? It is based out of purely economic reasons, or is it a challenge to Russia? MA: For Ukraine this is part of its economic difficulties. There is very little to attract it to Europe. In fact, what do they produce what European don’t already have. We have a huge agricultural sector, we have a heavy industrial sector and so on. It is really a geo-strategic issue I think to push Russia further and further back into Asia. And this is why Ukraine is important. Whether it is a good thing for Europe that Ukraine might yet become and economically associated with Europe is another question. If we think about countries like Romania, Poland, Bulgaria and Lithuania, we see massive migrations of their ordinary people into Western Europe, pushing down wages, making social problems that exist in Britain, Germany and France and Spain and Italy. Ukraine is a big country in an even worse starting point. From an economic point of view, more association with Europe will actually be a stimulus to more economic downturn and more mass migration, rather than a starting point for some reform process, which will improve life, despite the rhetoric about it. RT:Yanukovich said that he may review this early next year. Do you think perhaps there could be a deal in the future? MA: In addition to protesters on the street, there are also some economic interests in Ukraine who think they could benefit from this. I think if we look at the society as a whole and the economy as a whole, it’s an open question. So Yanukovich may be trying to calm the situation by saying this. He may also think that it is to his advantage. After all, he faces the problem that the most politically organized group, the decisive group, may be the pro-European lobby who offer very generous amounts of financial assistance. So he may be hoping to calm them. In a sense if he doesn’t listen to what they say, he should. Because essentially they are saying that he is already toast - that they protest about Mrs. Tymoshenko being in prison, but they intend to put him and his supporters in prison. This is part of a problem of the heightened tensions in Ukraine. Once you begin to have one group saying that the other side of the equation is traitors, enemies of people, the danger is that those people have nowhere to go. You begin to create the atmosphere of a civil war, rather than of a civil debate. RT:Brussels was very surprised when Ukraine made a U-turn over this. Are they afraid of losing face over this? MA: Brussels and West in general would prefer to be winners out of this and they hope that Mr. Yanukovich will shoot himself in the other foot, having not handled this crisis very well so far, but he will try to curry favor back in Brussels, but I don’t think this would rescue him. Maybe sadly there is nothing that can rescue the Ukrainian situation easily or simply.